MERCER, Ga. (AP) – Leticia Romero scored 17 points, while Ivey Slaughter had 13 points and 11 rebounds to help No. 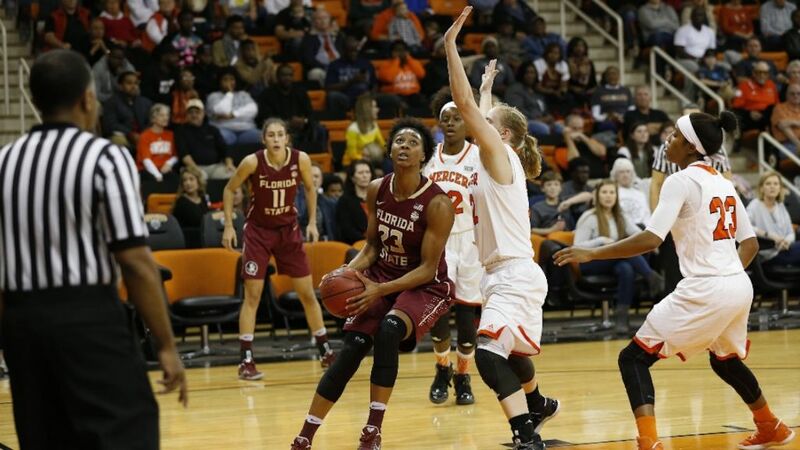 7 Florida State rout Mercer 83-40 on Wednesday night. The Seminoles (12-1) led by 21 after the first quarter and 53-17 at the half and never were challenged by the Bears (9-3). Florida State hit 30-of-58 shots from the floor (51.7 percent) and made 10 3-pointers. Romero hit six of her eight shots, including five 3-pointers. The Seminoles also dominated on the boards, finishing with a 56-28 rebounding advantage. Mercer, which hosted a top 10 team for only the second time in program history, struggled throughout, hitting just 16-of-64 from the floor (25 percent). Kahlia Lawrence scored 16 points to lead the Bears. Florida State point guard Brittany Brown finished with eight points and five assists, while Chatrice White had nine points and Maria Conde seven. • Senior Ivey Slaughter recorded her 21st career double-double, which is second most among active players in the ACC. She only trails Syracuse center Briana Day, who has 23. Her 11 rebounds on Wednesday marked a season high. • FSU stretched its winning streak to 11 games, tying for the second-longest in program history with last year’s squad. The school record is 12 straight wins in the 2004-05 season. • Senior point guard Leticia Romero drilled a career-high five 3-point field goals on her way to 17 points. She now has 38 double-figure point games in her career and eight this season. • The Seminoles enter ACC play with just one loss for the fifth time in program history. FSU wraps up non-conference play with a Feb. 13, 2017 matchup vs. No. 16 Texas in Tallahassee. • Since the 2012-13 season, the Seminoles are now 68-15 in non-conference play. • Florida State improves to 7-8 all-time against Mercer and has won the last seven games in the series. FSU has not lost to the Bears since Jan.26, 1981. • Florida State’s 10 3-point field goals made are tied for seventh-most in program history and are a season high. In FSU’s last meeting with Mercer on Dec. 15, 2015, it also nailed 10 3-pointers. • FSU shot 51.7 percent (30-of-58) for the game, its third straight contest shooting above 50 percent. FSU has made more than half its shots in six games this season. • The Seminoles recorded a season-high 56 total rebounds on Wednesday. They also finished with 21 assists, tying for their second-most this year. • It was another dominant first half for Florida State, which led 53-17 going into the break. FSU had already tied its season high of eight 3-point field goals made by halftime, and shot above 60 percent in the first half (61.3 percent) for the fourth time this season. • FSU has led at halftime in all 13 games played this season.